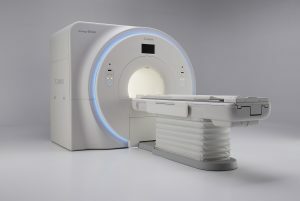 Canon Medical Systems Corporation has announced the release of its new premium 1.5T MRI system Vantage Orian. Vantage Orian will be introduced at the upcoming European Congress of Radiology (ECR) in Vienna, Austria, held between February 28 and March 4. Vantage Orian is one of Canon Medical Systems’ first major product releases since officially changing their company name from Toshiba Medical on January 4, 2018, and represents a major foray into the premium wide bore 1.5T market along with new technology designed to boost productivity, enhance patient comfort and deliver diagnostic clinical confidence to users and patients alike. In addition to the current 1.5T line-up of wide-bore Vantage Titan and standard bore Vantage Elan, Vantage Orian 1.5T represents Canon Medical’s premium offering in the 1.5T market segment. Utilizing migrated high end 3T technology, Vantage Orian offers referring physicians and patients diagnostic MRI imaging services with complete clinical confidence. Canon Medical System’s PURERF and Saturn Gradient technology means that stable and consistent imaging performance is ensured, increasing signal to noise ratio (SNR) by up to 38%*. Vantage Orian also offers one of the smallest footprints in the 1.5T wide-bore class and low power consumption eco features that reduce energy use by up to 21%*. The reliable system is equipped with excellent maintenance programs to satisfy the needs of hospital administrators. A relaxed patient is key in MRI, and Vantage Orian takes care of this with industry leading quiet scan sequences that reduce ambient noise by Pianissimo Zen technology. The 71cm wide bore and immersive virtual MR Theater are designed to put patients at ease. Vantage Orian also addresses challenging patients with Pediatric SPEEDER coils, contrast free applications and ForeSee View for simplified scan planning. The Vantage Orian can be viewed at the Canon Booth in Hall X3 during the ECR congress in Vienna. The official reveal will take place at 11am on March 1st, 2018. Delegates interested in the the latest 1.5T technology from Canon Medical Systems and in the possibilities this device yields for their facility’s imaging services, are cordially invited to visit the booth. Canon staff will be happy to guide them through the latest 1.5 MRI offering from Canon Medical Systems.